Let’s Sew Together! Welcome to the January Block of the Month Pattern for 2018! It’s the first day of the first month of a brand new year, so now is a great time to join us for the start of our #QP2018sewalong. If you’re sewing along with us and want to enter to win prizes each month, post your finished blocks to Instagram or in our Facebook group (between January 15th and January 31st) with the hashtag listed above and you’ll be entered to win fabric, thread, and other wonderful prizes! You’ll find the instructions for Block 1 on page 27 of the Quilter’s Planner companion magazine (it came with your purchase when you bought a Quilter’s Planner). The goal for the week is to pick fabric! We know this may feel challenging, so be sure to join our Facebook group if you need ideas, or have questions. And did you download the coloring pages to help you choose your fabric yet? This is a great way to figure out what color combinations make your heart sing. 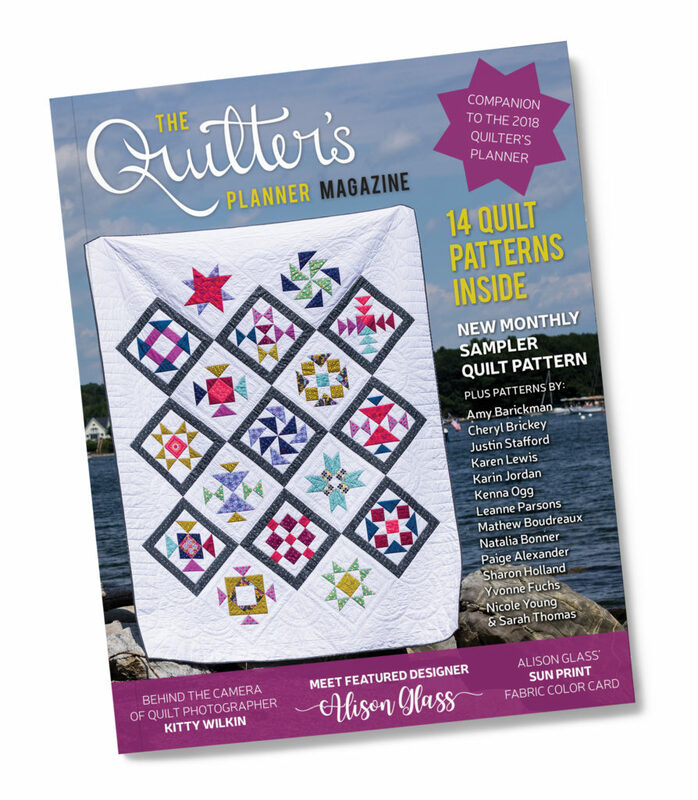 We are on Block 1 (page 27 in the Quilter’s Planner Magazine). 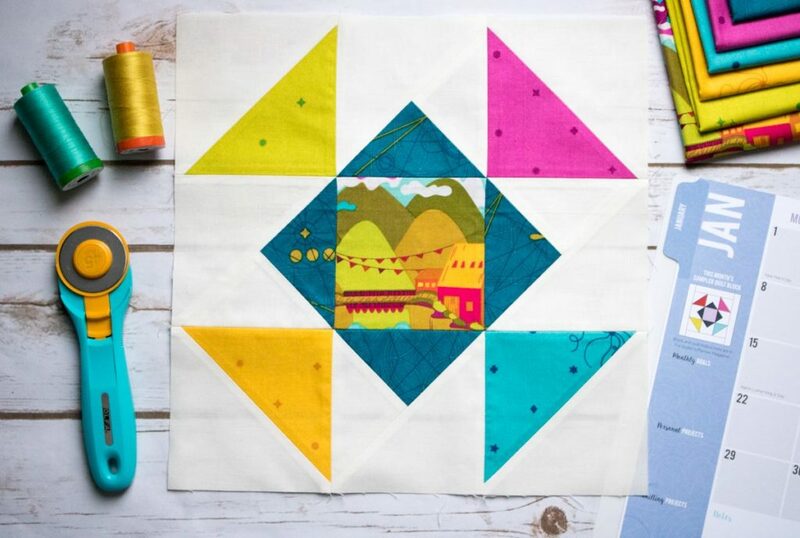 Block 1 combines triangle and square shapes for a colorful design. Block 1 can be approached in a couple of different ways. 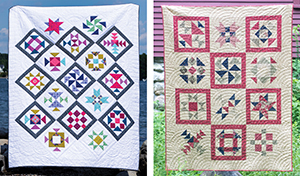 For our Block 1, we used the following feature fabrics by Alison Glass for Andover: Lilliput in Sunrise from Diving Board; Diatom in Parakeet, Cosmos, Seaside, Canary from Sun Print 2018; and Compass in Peacock from Sun Print 2018. Before you begin constructing your first block, please note that the pieces that will be used to make the Half Square Triangles (HSTs) are SLIGHTLY oversized, so it will be important to remember to sew with a scant ¼” seam allowance as mentioned in the pattern notes on page 25 (this will be consistent through all of the blocks). When making the Fabric F HSTs in step 1f, we did square the blocks to 5” x 5” (although the pattern notes that it’s not necessary). As noted in Tip #1, these HSTs are only slightly oversized, and squaring the starting point typically will give you a greater likelihood of success as the units are assembled. Split Quarter Square Triangles (SQSTs) may be a new technique for you. But don’t worry! They are as easy as HSTs! Make your HSTs units (in step 1f), layer them with their corresponding background square, mark a line across the diagonal so it crosses the HST seam (perpendicular not parallel), stitch on either side of the line like you normally do for HST, and cut them apart! When you’re laying out the pieces to assemble the block, make sure Fabric F (it’s dark blue in the diagram) is on the side that is touching your center square. Feel free to make a second version of this block for your Modern Bliss layout too, or choose another favorite later. You may want to wait to add the borders to your blocks until you have finished them all to give yourself more flexibility with arranging them at the end. Between the 15th and the last day of the month, sew up your block and post it by 12:01 am Central time. You can choose whichever platform you want to share on. For Instagram (please use the #QP2018sewalong hashtag) or to the Facebook Group (use the same #QP2018sewalong hashtag). We will have prizes for both, so please pick whichever location you are more comfortable with using (not both). When you post a photo of your block on Instagram or in our Facebook group by each deadline set for the mont, you’ll be entered into a drawing for some great prizes from our sponsors: Andover Fabrics, Aurifil, OLFA, and the Quilter’s Planner. Each month’s entry must be posted by 12:01am Central Time by the last day of the month to be eligible. You must tag @thequiltersplanner on IG and @QuiltersPlanner on Facebook with your entry and use the hashtag #QP2018sewalong so we can track your entry. If you win one month’s price, you will be eligible to win again at 6 months, and 12 months, if you complete and enter each month’s block on time. Some prizes may not be available for participants outside the US due to shipping costs. Winners will be contacted via social media and asked to provide an email address and shipping address. If a prize alternative is required, it will be sent via email. Fabric requirements are listed for the whole project on p. 26 of the pattern magazine. They are also listed per block, if you do not plan to sew the entire sampler. Along the way, we will provide you with tips and tricks on Instagram, in our Facebook group, and via email for success and to answer your questions as they arise. 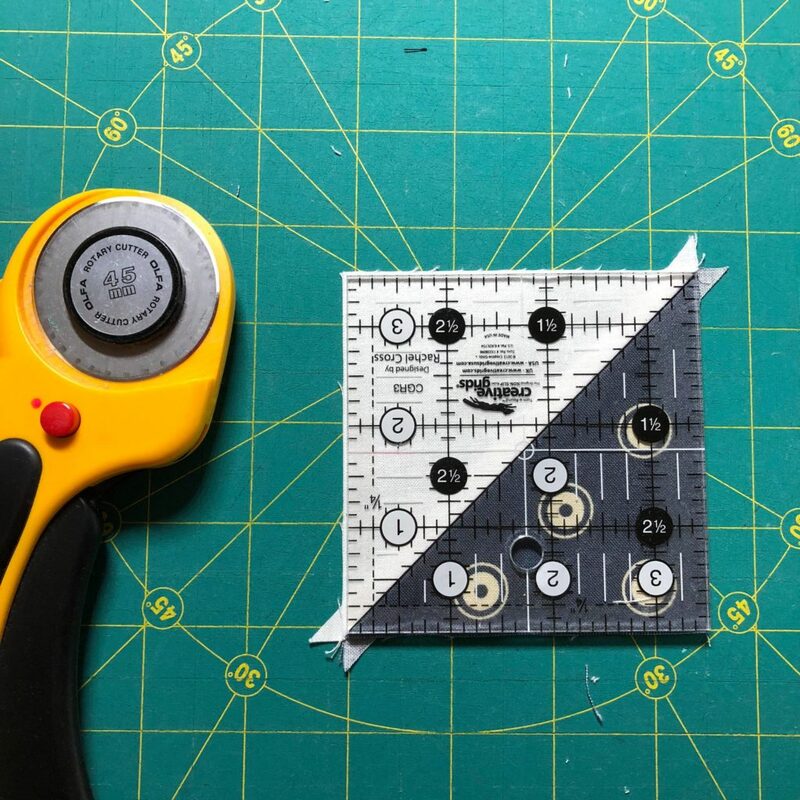 While these aren’t required, 3½” and 4½” square rulers may speed up the process of trimming and squaring your blocks. If not, there’s no need to worry. Many quilting rulers have 45 degree lines printed on them. These handy lines are great for helping you to align your seams.